Karakul Sheep are a fat-tailed (and fat-rumped) sheep characteristic of the Middle East as well as southern Asia and North Africa (although they were found as far south as the African Cape by the seventeenth century). As the general name implies, they are distinguished by an accumulation of fat in the tail and around the rump which evolved as a store of food necessary for survival in a harsh, drought-prone environment. 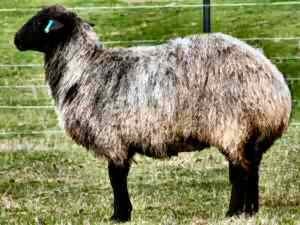 Descriptions of such sheep can be found in the earliest records of British exploration, but they have been known and bred for thousands of years as is witnessed by Biblical reference to the type. The Book of Leviticus records that a ram was bought for a burnt offering. After it was slain, Moses "took the fat at the rump" which was then burnt at the altar. Besides the characteristic ‘fat-tail’ feature, they are relatively long-legged with a long hairy coat, mainly black. Horns, Roman noses and pendulous ears add to their highly distinctive appearance. They are well adapted to a hard, dry environment. The Karakul is the original ‘Persian lamb’ which has been known as a distinct breed for thousands of years. It is most famous as a producer of high grade pelts for quality garments – the best being taken from unborn lambs and those up to three days old. The hairy coat of older animals was used in the production of Persian carpets. Karakul meat is very lean and their abundant milk supply is used for butter and cheese in some countries.